Nocturn Keyboard is an intelligent plug-in/sequencer controller. It has a high quality 'Fatar' keyboard, with 8 drum pads and a total of 33 assignable controls, which allow you to get hands-on control of your plug-in instruments, effects and sequencer. Most keyboard controllers have two big problems: The idea of being able to control software parameters with knobs and buttons sounds great. However, the hassle of assigning them, and remembering what they are assigned to becomes so tedious that you always end up turning back to your mouse. Nocturn Keyboard's Automap control software solves both these problems. To assign controllers, simply click on the parameter, touch a knob or button, and it is assigned! It also enables you to keep track of what is assigned to what - instead of using a small monochrome LCD screen, Nocturn Keyboard displays control information where you really need it: on your computer monitor. The Automap software graphically displays Nocturn’s control surface. The controllers themselves also tell you what is going on: LED rings around the 8 encoders show their current settings, and LED’s behind the buttons tell you if they are on or off. Apart from from high quality hardware, what really sets Nocturn Keyboard aside is the Automap control software. Automap is now even more powerful and easy to use. Nocturn Keyboard ships with Automap standard, which acts as a software interface for the unit. Automap enables you to map parameters in your software plug-ins, straight to dials and buttons on the controller by simply clicking on a parameter, then touching the controller. There is no longer any need to sift through long lists of MIDI continuous controller numbers. This applies to encoders, control-buttons, drumpads, modulation wheel, sustain and expression pedals; Automap can instantly assign them all to software parameters. Automap can integrate with Logic, ProTools, Digital Performer and any other HUI compatible sequencers, using the HUI control protocol. The Automap GUI graphically displays all the controls on Nocturn Keyboard, visually showing you what software parameter is assigned to each control, exactly as it is laid out on the unit. You can also name each control, turning the GUI into a giant screen where all information is instantly displayed and updated. With this, there is no need for a tiny LCD screen on the unit, which can only display very limited information. Automap will automatically assign knobs and buttons to parameters on a huge number of the most popular plug-ins. We are constantly building more maps which are available on the community pages of the Novation website. Nocturn Keyboard will automatically assign controllers to mixer and transport functions in all major DAWs/sequencers. • Velocity-sensitive, keyboard from Fatar, with assignable after-touch. The Nocturn Keyboard feels like playing an instrument rather than a computer peripheral. • Brightly lit 11 segment LED rings around the eight smooth encoders, and backlit buttons throughout provide instant visual feedback for every physical control. • All 8 oversized encoders are touch sensitive, bringing up mapping information and allowing you to ‘touch’ in automation data on DAW’s with a ‘touch’ mode. • Allows you to instantly 'learn' controllers to plug-ins. The GUI graphically displays Nocturn Keyboard's control surface on your computer monitor, enabling you to see exactly what is assigned to what, without using a tiny LCD screen. 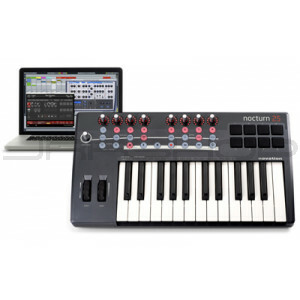 • Nocturn Keyboard features 8 'softfeel' velocity sensitive drum pads. These can do more than just trigger notes and sketch drum patterns, all can be assigned to control software parameters. • 8 trigger pads, 8 dials, 14 buttons, modulation wheel. Sustain and expression pedal control can also be added. • The 9th encoder is a unique 'Speed Dial' which allows you to instantly change the value of any parameter the cursor is pointing at, with no assignment needed whatsoever. • Nocturn Keyboard is powered by USB saving valuable plug sockets. It can also be powered down without being unplugged, preserving battery power in laptops. Nocturn Keyboard can be set up for use as a serious DAW/sequencer controller, as well as its ground-breaking Automap control of all VST/AU/RTAS/TDM plug-ins. See below for details of how Nocturn integrates with major DAWs. Further Control: More features can be controlled with Nocturn Keyboard via Ableton's 'learn' mode.